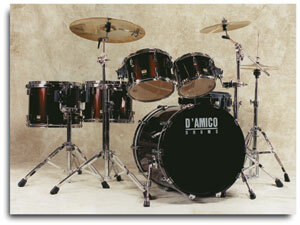 D’Amico Drums announces the launch of a new project attempting to transcribe the drum parts of Ringo Star. The project, entitled Charting Ringo, will focus on creating transcriptions that have been developed through intense study and investigation of Ringo’s drumming. We don't claim them to be exact replications of what he played. We can only use our ears and eyes and creativity to try and get as close as possible. On Charting Ringo, Gene D'Amico, Jeff Olson and Nicola Marangon attempt to transcribe the parts that Ringo played on some of the Beatles records. The transcriptions document, for instructional purposes, the sticking and drum selection on each song to the best of our abilities. Painstaking research of videos, audio and printed material about the various recordings along with our personal interpretation of the recording was used to develop the transcriptions. Our hope is that drummers interested in how Ringo played the drums will benefit by our documentation efforts. Each video has several camera angles to help capture the sticking and instruct the viewer, beat by beat. In some cases the video is slower than the actual song was played in order to highlight certain aspects of RIngo's left handed drumming.